In large bowl, crumble cookie dough; stir in oats, flour and lemon zest until well blended. Reserve 3/4 cup mixture for topping, and transfer to small bowl; stir in almonds, and set aside. Press remaining mixture in bottom of pan. Bake 13 to 18 minutes or until light golden brown and center is set; cool 10 minutes. In medium bowl, add 1 cup of the berries; mash slightly with potato masher or fork to release some of the juices. 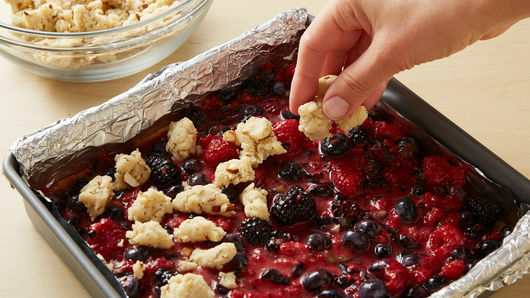 Stir in remaining Filling ingredients, including remaining berries, mixing well. 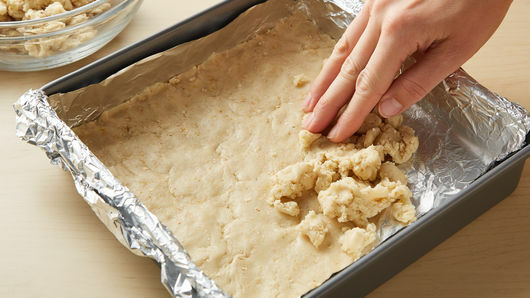 Spread filling mixture evenly over crust. Crumble reserved cookie mixture over filling. Bake 43 to 48 minutes or until top is golden brown; cool 15 minutes. In small microwavable bowl, microwave baking chips uncovered on High 30 to 45 seconds or until chips can be stirred smooth. Spoon melted chips into small resealable food-storage plastic bag; partially seal bag. Cut off tiny corner of bag, and squeeze onto bars. Cool 1 hour, then refrigerate about 1 hour or until completely cooled. Cut into 4 rows by 4 rows. Cover and refrigerate any remaining bars. Lining the pan with foil makes removing the bars from the pan very easy, and makes cleanup a breeze, too! Fresh berries vary depending on the season. Some may be very juicy, while other times may not be as juicy. 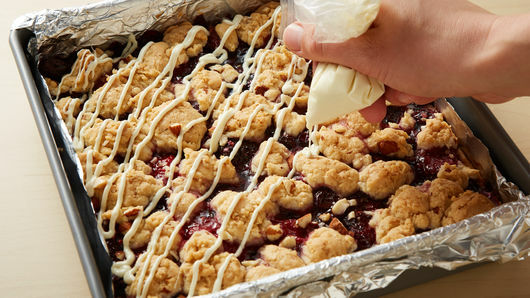 Adding cornstarch to the sweetened berry mixture ensures the extra juices are thickened during baking. 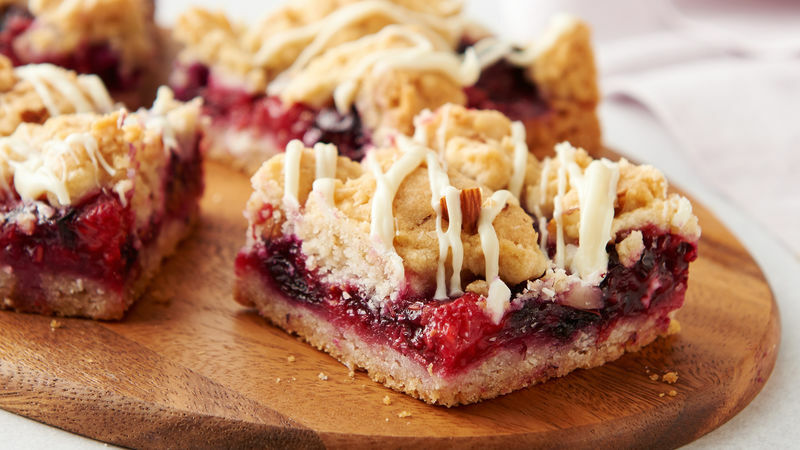 Cutting the bars is made easier by refrigerating before serving.